SALE Letters Cardboard Cutout Standup Display - Dino Rentos Studios, INC. 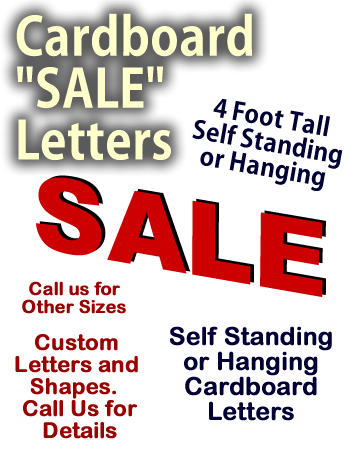 Giant 4 foot tall "SALE" letters. Select your color or Fill in with a graphic. Order them with Grommets to hang or a cardboard Easel to self stand. Printed with a Matt Finish or Upgrade to Gloss Finish. Upgrade ! And have the back of the coin printed also.